» Should I Use a Recruiter in My Job Search? Should I Use a Recruiter in My Job Search? 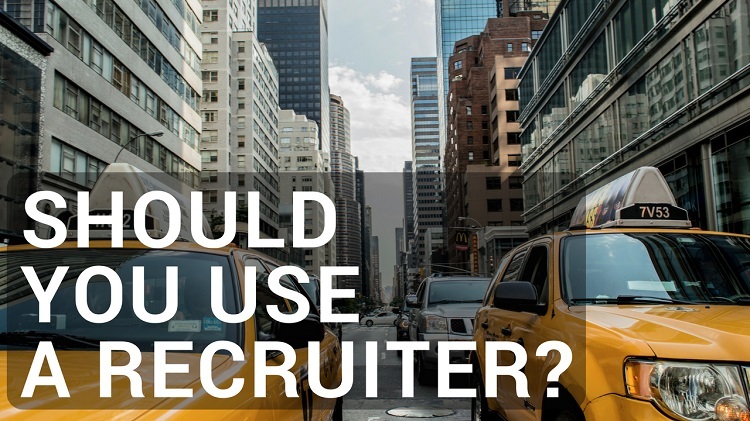 The answer is “it depends.” I’m going to show you how to decide for yourself if you should use a recruiter. First things first… we need to separate the two types of recruiters out there. The two types are “in-house recruiters” and “agency recruiters”. In-house recruiters work for one company and help that company hire. That’s it. In-house recruiters conduct job interviews and “screen” applicants but they can’t take your resume and show it to multiple companies, and they can’t help you expand your job search. So let’s move on. What about agency recruiters? They work for a recruiting agency and help multiple companies find people to hire. They’re the ones we need to focus on in this article. But not so fast… they can’t help everyone. Let’s look at why. That’s the reality. They serve the needs of the companies who hire from them. When’s the last time you paid a recruiter a single penny as a job seeker? The answer should be “never”. Because of the pressure to fill positions, they need to focus on job seekers who have in-demand skills or very impressive experience. Not necessarily the people who need their help most. So, let’s take a look at how you can quickly decide whether or not you should use a recruiter in your job search. If you fit into one or more of these groups, you should consider using a recruiter to find a job. You work in a field with a shortage of talent. There are more open positions than good people to fill them (software engineering is an example right now in many cities). You have very specific and hard-to-find skills. Or a lot of experience in your industry. You’re a specialist or expert in your profession. You’re an experienced manager or executive. Most recruiters get paid a percentage of your starting salary when they find you a job (15-25% is normal) so they’re willing to spend more time helping you if the potential payoff is bigger. You’re a consultant or contractor who is looking for a temporary position, not a permanent job. If this is the case you should talk to plenty of contract recruiters. Most of this article assumes you’re looking for a full time, permanent job. You are looking to make a transition or pivot your career. A company isn’t going to pay a big fee to a recruiter if you’re not coming in with specialized knowledge and a track record of doing what they need. So if you’re a customer service expert but looking to get into marketing, you’re better off job hunting on your own. Your job does not require specific skills or knowledge, so companies can easily find enough people to fill open positions. There’s no harm in sending your resume to a few recruiters. If you want to, go for it. Regardless of what I said above. Why do I say that? Well… it doesn’t cost you anything to try. Plus they might give you some resume tips if you ask. They contact a recruiting agency and talk to a recruiter. The recruiter takes their resume and promises to keep an eye out for opportunities. Two weeks pass. The person hasn’t heard anything. They start getting frustrated and angry. Why isn’t he recruiter helping?? Well, because of the reasons above. So here’s the key: You can talk to a few recruiters, but don’t count on them. You should assume you aren’t going to hear anything from them and go start your job search on your own too. If they are able to help, it’ll be an added bonus and a nice surprise. But it won’t hurt you if they can’t. If a recruiter says they can’t submit you for a job, you can still apply on your own. Sometimes a company will be more willing to hire you without the recruiter’s fee attached. So don’t let yourself get discouraged. If you apply on your own you might still get that job. Use your network. Talk to people you know and see if they know about any relevant openings. This is one of the best ways to get hired because companies trust you more if you are referred by somebody they’re familiar with! Job boards. Indeed is one of the largest and easiest to use. Start there. Use Google to find individual companies and apply through their websites.